To put it simply, it has been an incredibly busy week for those at Google… Here are some highlights: Google introduced the Google Wallet, Google partnered with the Israel Musem to release access to the Dead Sea Scrolls, and also held the Google Zeitgeist conference. Access to The Dead Sea Scrolls for all! To celebrate the Jewish New Year the Dead Sea Scrolls are now online and accesible to all! It is a project of The Israel Museum, Jerusalem, and powered by Google technology. Utilizing Near Field Communications (NFC) technology, the Google Android software, and the Nexus S 4G by Google (available on Sprint), Google was able to develop and release the Google Wallet. It is rather limited in practice, since it can only be used with one phone and on one carrier. However, Google has laid the foundation for exponential growth by partnering with Citi, MasterCard, First Data, and with acquistion of Motorola. I need to do this!!! Vooray, can I get an invite??? It was rather random the way I came across the Knapp Sack by Buck Products. It was more of an internet stumble during a somewhat depressing Wednesday on the job. Wednesday is hump day, and for me a day I choose to carve out fifteen minutes or so to dream about where I might travel next… I was in a mountains mood, and started googling around, when I came across Alex Buck’s Buck Products Knapp Sack. I particularly noticed this pack…. 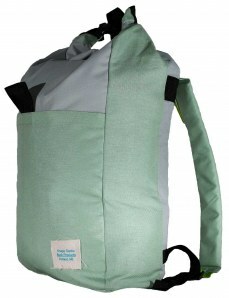 The bag is described by Buck as Grey/Mint Green. To note, I love everything green, but I feel that mint green is a great color, and will be incorporated in more consumer goods in the near future. It is a subtle colored reminder of good times… I’m thinking a heavily bourbon leafy Mint Julep on a crisp spring Kentucky Derby day! Simply put, Buck Products is a start-up bringing fresh products to the marketplace. His concept is ingenious, and the products are battle tested in the back country. After reaching out to Alex, this is some of the information he shared with me. “Began sewing after a quick lesson from my wife and also after receiving a sewing machine for a wedding present in fall of 08 (quickly broke that machine and opted for industrial standards). Started sewing rolltops because I was tired of overly technical bags being used for non-technical tasks. 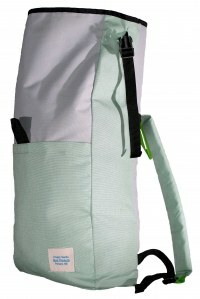 I saw a need for a simple, tough bag for everyday hauling. The idea of the rolltop came from growing up in New England and spending my childhood summers on long wilderness canoe trips at a camp called Kieve in Maine. We used river duffles (waterproof rolltop bags) for hauling our gear. Loved the simplicity of them and the lack of zippers. After my sewing got more and more dialed they began to draw attention and that’s when I realized that there could be a market in my design. Custom colored 1000 denier cordura fabric choices were another perk that helped draw in customers. From there it went viral and pretty soon I was getting orders not just from friends but friends of friends of friends all over the country (mainly cities and mountain towns right and left coasts) etc. I soon began getting some internet press and that really helped draw all sorts of random orders. I came to Bozeman for school in fall of 05, graduated in 09 with a BFA in Sculpture. Chose this place because of the amazing mountains, rivers and everything else that is Montana. It also happens to be an outdoor gear company mecca. I spend my time mountain biking, skiing, sewing, playing with my dog, wife and 2.5 year old son (not in that order of course). 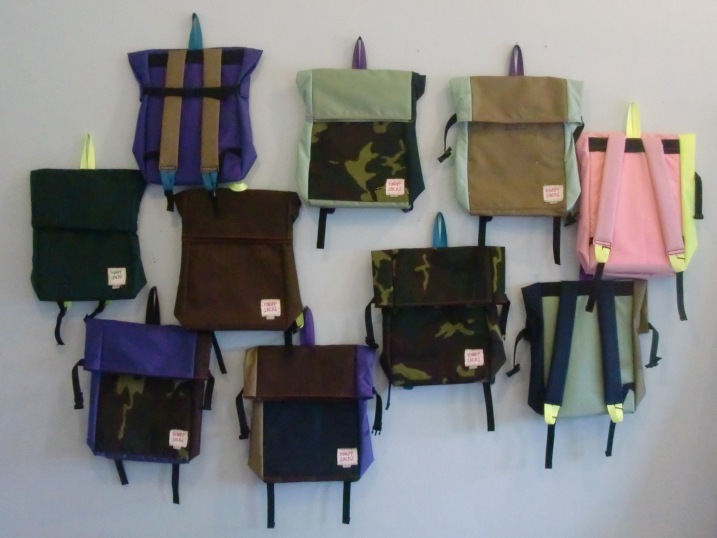 Take a look at some of Buck Products offerings by visiting http://buckproducts.com/ and/or http://knappsacks.blogspot.com/ and if you like what you see, please use the following information to order one of these beauts! To get a knappsack on your back you can call Alex Buck (406.5993488), facebook, or email Alex Buck (akbuckbuck@gmail.com) and a pack will be made and sent (included) to you from bozeman for a legit cost of $75 (shipping included). If you need that sack ASAP, get the $65 stock Knappsack, and it will ship immediately.